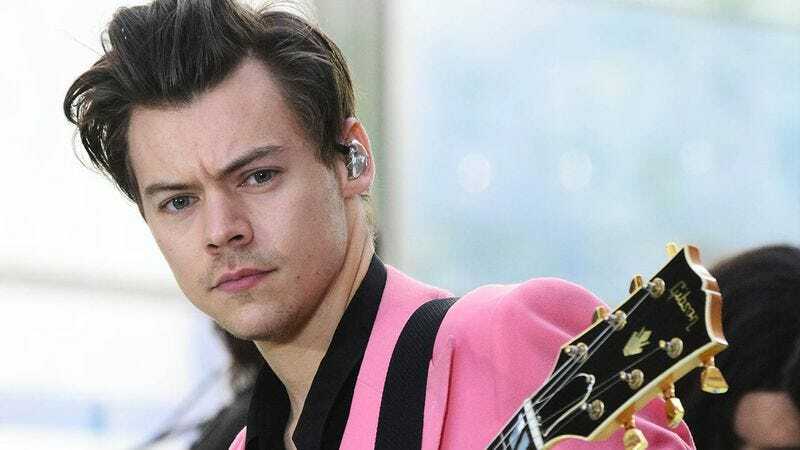 In the 16 months since One Direction’s breakup, Harry Styles has been slowly distancing himself from the world of teen superstardom and working toward carving his own path as an artist. Having just released his first solo album and made his acting debut in the upcoming war film ‘Dunkirk,’ we were thrilled to sit down with Styles and chat about this exciting time in his young career. 1. Do you still keep in touch with the other members of One Direction? Oh, absolutely, I speak with them every day. I’ll usually call Niall around 3 a.m. to discuss our favorite types of juice, and then around 3:05 a.m. I’ll dial Zayn to tell him what types of juice Niall likes. After I get off the phone with Zayn, I’ll give Liam a ring, and we’ll spend 14 hours arguing about whether Trotsky had it coming. Then, before I go to bed, I’ll give Louis a quick call to ask him if he’s learned any new facts about blimps. Usually he has. 2. What’s the craziest thing a fan has ever done for you? One time while I was signing autographs after a show, an old man in a cloak walked up to me and held out his two balled-up fists. “Pick a hand to seal your fate,” he said. I picked the left one. Right after I did that, a security guard tackled the old man, and two dead seagulls fell out of his hands. But when the guard pulled the old man’s hood down, he wasn’t an old man anymore. He had my face. He looked exactly like me. The guard then immediately let him go because he thought he’d made a mistake. The old man—still wearing my face—then smiled at me and turned to ash. 3. How did you get into singing? Well, by the time I was around 7 years old, I had already been opening my mouth quite a lot. If you knew me back then, you knew me as the weird kid who wasn’t playing outside with the others but rather was always in his room with his mouth wide open. Once my parents realized I had a knack for opening my mouth, they encouraged me to take the next step and try emitting melodies from it. 4. You’re about to appear in your first film. How is acting different from singing? 5. Any chance that One Direction will ever get back together? I honestly haven’t thought about it much. I’ve been so busy with my own projects and the violent orangutan who has overtaken my living room that it hasn’t really been on my mind lately. I wouldn’t rule it out, but for the time being I’m really just trying to stay focused on my solo work and on getting the orangutan to free my family members, whom he’s taken hostage, and to stop urinating on my Teen Choice Awards. I’m just taking things one day at a time.